Among the 50 Year Breeders being recognized are Gilbert and Zelda Lutter. Pictured is Gilbert selling horses. 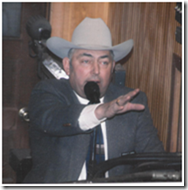 He began auctioneering in 1959. PIERRE, SD - The South Dakota Quarter Horse Association (SDQHA) is hosting its annual banquet that will honor three South Dakota AQHA Hall of Fame winners, South Dakota Legacy breeders, and South Dakota 50 year breeders. The event also recognizes both adult and youth association award winners. Beginning Friday, January 5, 2018 with a social at the Casey Tibbs Center in Ft. Pierre, SD, the convention runs through Saturday, January 6, 2018 with programs and meetings taking place at the Ramkota in Pierre, SD. Headline entertainment for both evening events is award winning cowboy performer, Red Steagall.